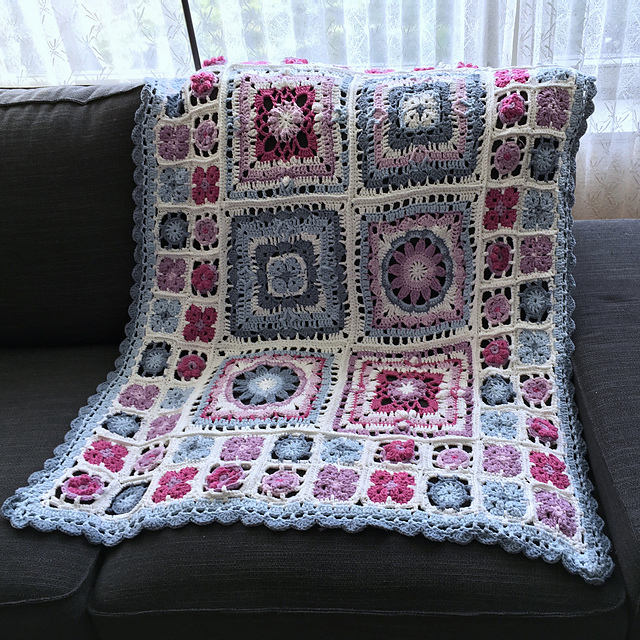 Last year in spring I started the Drops CAL for Spring Lane Mystery Blanket CAL. The beginning went well, with a lot less swearing than during the (still unfinished) The Meadow Mystery Blanket CAL. Then some people who crochet a lot better and faster than I do and probably don‘t have 30 projects going at the same time complained that the clues were too small. Drops listened to them and shortened the timeframe for the CAL. The clues now were „Make one million patches in each of these three color combinations“. It was hard, but I still kept up more or less. Then, after having crocheted together a handful of the squares, my mojo left me, other projects were more exciting and the blanket squares lived in a bag until Monday last week, when the random number generator told me to work on the blanket. The new project a day I started on new year is fun, but it doesn‘t really help finishing anything. So I decided to work on the blanket until it‘s done. I spent several days crocheting squares together. It was a little strange that I seemed to have quite a lot leftovers, but I had followed the pattern, so everything had to be okay, right? When I was almost done with the first part of the outer edge, I realized I had messed up and crocheted a square instead of a rectangle. So I added more squares and had just two squares extra. That seemed reasonable, so I started the next round of crocheting the outer squares together. The middle of the two square outer edge was still unconnected. When I was done with that, I wove in one million ends and cut off another one million ends that I had crocheted over. That alone took all of Saturday and part of Sunday. I also realized that some of the edges were really wonky. The edges of the 2 squares next to each other didn‘t always align, which got worse and worse until it was off by almost an inch. But I didn‘t want to care anymore. When I was done with that, I put the inner rectangle into the outer rectangle to crochet them together, but something was off. One of the long edges was 13 squares long, the other one just 12. So I unwove the ends, undid the seam, added in the last two squares and produced more ends. The two missing squares were exactly where the wonky squares were, so I took that as a sign, undid some more of the seam and corrected it. Hours later I was ready again to join the outer frame to the inner rectangle. I had realized long ago that I wouldn‘t have enough white yarn for the edge, but I also didn‘t have enough for joining. By maybe 30 cm / 12″. Hubby said I wasn‘t allowed to cut that stupid thing and throw it away so I went searching for yarn and – I found one more ball of white. Yay! So finally everything was joined and I spent Sunday the evening working on the edges. No new catastrophes happened, but at 11 pm I had finished three sides of the FIRST round of the edge. But I persevered, and lo and behold, it DID end. I found another ball of the jeans blue yarn that I needed for the last round of the edge and then, Tuesday at about 1 AM, it was done. All’s well that ends well, isn’t it? I’m in love with the blanket again and hope it will take the cats a while to love it to death. I’m not sure if I should join the next Drops Along this year (if there is one)… I still have my Meadow to finish!